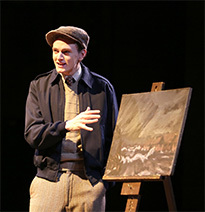 Directed by professor Heidi Winters Vogel, The Pitmen Painters tells the story of a group of British miners, who in 1934 hire a university professor and painter to teach them an art appreciation class. “The historian starts talking about Leonardo da Vinci, and the miners are clueless,” Winters Vogel told The Bachelor. “The miners are opinionated about art and what should be good art,” she said, and so — since they don’t understand artistic theory — they begin to create their own paintings. Along the way, they become famous as artists and working-class heroes. “The paintings they produce are very good, and the ‘Pitmen Painters’ become a sensation between the two world wars,” said Winters Vogel. Written by Lee Hall, the play opened in Newcastle, England in 2007 before moving to London and eventually to Broadway. It is based on the real experiences of the Ashington Group. “I think it’s a really lovely story with interesting, intriguing characters, and that’s really the kind of work I like to do – stories about people and these are good people with interesting stories,” Winters Vogel said in the Wabash on My Mind podcast. Four seniors headline the cast — Quinn Cavin as Robert Lyon, the art historian; Louis Sinn as Oliver Kilbourne, the best known of all of the miners-turned-artists; Will Maloney as Harry Wilson, the only artist who is not a miner; and Teague Meiers as the hilarious Jimmy Floyd. The cast also includes Dei’Marlon Scisney as the Young Lad and Ben NIcholson, Austin Ridley as George Brown, Pia Schuebel as Susan Parks, and Julia Phipps as Helen Sutherland. Ian Little is the Stage Manager with assistance from Ace Dzurovcik. Austin Yeomans is the Assistant Director. The design team includes Scenic Designer Bridgette Dennett, Costumer Andrea Bear, Lighting by Scott Olinger, and Sound by Tim Melville. 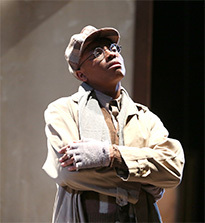 This week’s edition of the “Wabash On My Mind” podcast talks to “The Pitmen Painters” director Heidi Winters Vogel and cast members Louis Sinn (Oliver Kilbourn) and Austin Ridley (George Brown), The trio discusses a number of topics, including theater at Wabash. Just click the red arrow in the graphic to enjoy an oral preview.